A Deming and Goldratt business novel plus online Learning Centre. The successes, the challenges, and the way ahead towards a new era for organizations. Never before has there been such a powerful story combined with a Knowledge Base of tools and insights for implementations. The Human Constraint explores the single greatest challenge any leader faces in an organization: creating a unified and systemic response to opportunity. Dr. Montgomery's book, along with its detailed website materials, shines a light that guides us as leaders and managers toward a more sustainable and productive future. "Bought it yesterday, can't keep my eyes out of it... Excellent writing about an excellent integration of Deming and Goldratt with excellent resources and tools. Definitely a must-read for every CEO (and all other C's), every manager and everyone who claims to strive for improvement in any aspect of his/her life! Thank you Angela Montgomery PhD for your inspiring story!!" Buy & Download PDF & ePUB versions Now Two books in one with over 60 pages of supplementary material on applying the Theory of Constraints and Deming's management philosophy. I can’t count how many business books I’ve started to read and couldn’t finish – my response being along the lines of “this is just too boring” or “I know all this stuff – doesn’t everybody?” Angela Montgomery has solved this problem with a new way of thinking that goes beyond conventional approaches. She captures today’s complex realities of business in this novel. Read it and enjoy. I know you will learn a lot, and finish it! Angela's book, "The Human Constraint," is a fast-paced novel about how a team of colleagues and friends consistently work through their business challenges. It is a pleasant read in its own right; but it also contains very relevant messages about how you can best manage businesses. Relating to my own experience, I constantly saw the transformative forces of Inspired Leadership, Unity of Purpose and Community at Trust at work throughout the entire narrative. Management methods of the previous millennium are insufficient and even inadequate. New ways to attain sustainability through win-win thinking are required. Ultimately, the problem, the real constraint is not that of limited resources in an ever shrinking world, but that of the way we all think and work together. 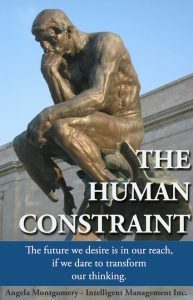 The ultimate constraint is us - The Human Constraint. The book's moral is about developing new ways, based on the theory of Profound Knowledge of Edward Deming and the insights of Eliyahu Goldratt, to re-found the social contracts that tie us all together in the destiny of this little blue planet of ours. If you are unfamiliar with these ideas, Angela's book is an enjoyable story to learn about them. If you know about these ideas, you will find a new source of convincing optimism. Read it! What a wonderful and original idea to teach fundamental business principles through the medium of a novel! 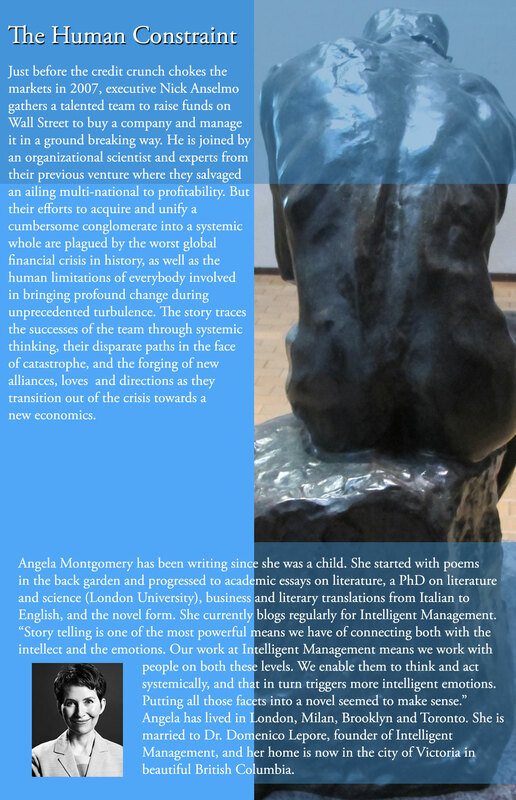 Angela Montgomery’s delightful prose in The Human Constraint will have you captivated, and within its pages you will find a convincing model for a new, more intelligent approach to business. While greed and personal gain motivates so many of our business decisions, Montgomery draws us eloquently to a more sophisticated approach where problems are approached with scientific precision by means of brilliant analytical tools. The Human Constraint is a must read for any entrepreneur or executive looking to hone win-win thinking and build a more effective and sustainable business. Rabbi Chaim Miller, author Turning Judaism Outward-A biography of the Lubavitcher Rebbe, Rabbi Menachem Mendel Schneerson, and editor of the Kol Menachem series. In The Human Constraint, Montgomery brilliantly delineates how to transform a large organization from silos, hierarchies and a zero-sum approach (where someone must win and someone must lose) to an organization that is systemic, project-based, win-win, leverages the knowledge and intuition of its employees and is highly profitable. Montgomery illustrates the application of the methodology in a number of industries from mining to software development, leaving the reader convinced that the tools and methods demonstrated in the book have broad applicability. In addition to providing a set of tools for transforming private sector corporations and public sector institutions, The Human Constraint is a superb literary work. It has an aliveness to it that few novels of this genre could hope to accomplish. The book brings to life the very real struggles and trials of innovators, pushing against normal and fighting, systemically, for transformation. The real possibility of The Human Constraint to transform business as usual is in the hands of those who read it. The tools are there and well delineated. What’s required for true transformation to a new economy and a new economics is the courage and discipline of readers of The Human Constraint is to embrace the tools and methodology and to put these to work in our respective organizations and industries. Take yourself on a memorable journey towards the future of better organizations. © 2018 Intelligent Management Inc.